Katinka Matson experimented for five years until she developed a technique that allowed her to place flowers on a flatbed scanner, and scan them undamaged, against a black background that made the flowers even more luminous. She also realized the photographs were strongest as Iris Giclee prints on 3' x 4' canvases. "Hyperrealism" is more reminiscent of the botanical illustrations made by Maria Sibylla Merian made in the 18th century as well as other artists of that era. The aesthetic here emerges from the scientific view and precise technique, less from the creative sensibility of the artist. The art book publisher Phaidon, recently published the German edition of the comprehensive work Plant: Exploring the Botanical World, featuring "300 of the most beautiful and pioneering botanical images ever". Katinka Matson's photography is presented here as the apogee of a line in art history that prefers the faithful portrayal of nature to the aesthetic ideas of artists. 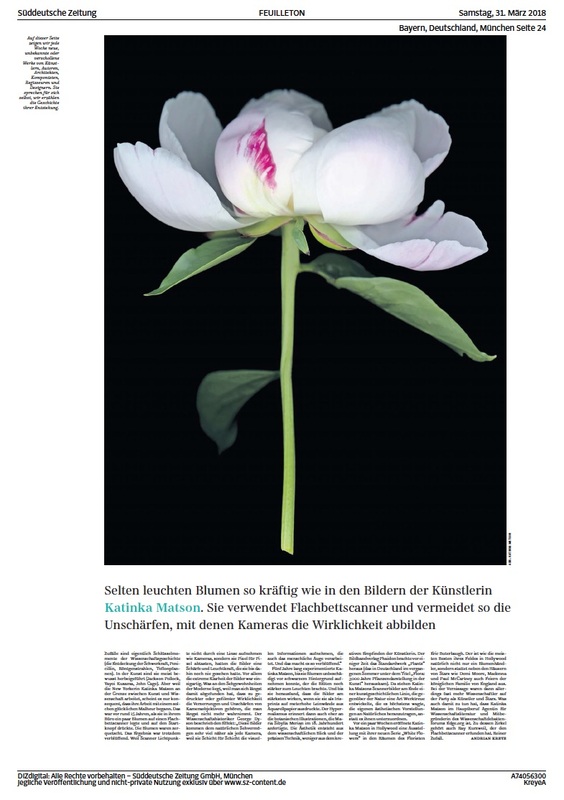 First published in German by Süddeutsche Zeitung, March 31, 2018.